Why I’m In Love With Andrew. Yes, That’s Right: Love. No, not in that way. Not that there’s anything wrong with that. It’s just that you’re a good guy and I’ve known you for almost ten years now. You’ve been a great client of ours. You’re nowhere near our largest. In fact, I just checked this and I think you paid us less than $2K last year for services. But that’s completely OK. Because I look forward to speaking with you. I’m happy to be your service provider. I really enjoy doing business with you. You are the kind of client everyone should have. And everyone should aspire to be. Why is that? For starters, you are nice to me and my people. You treat us with courtesy. You offer coffee. You place us in a nice conference room or cubicle when we come onsite to do work. Your employees, watching how you act, act the same. We never feel like villains when we come to your offices. We appreciate your friendly atmosphere and we like the fact that you and your people treat us like an extension of your own company. Some of our clients treat us terribly: their offices are dim and their employees pretend we don’t exist. It’s as if we’re the enemy. We’re not. And we appreciate that you recognize that. You do what you say you’re going to do. You’d be surprised how many people don’t. They sign contracts with us, promising to pay when services are performed, and then we find ourselves chasing them down for money weeks or even months later. It’s demoralizing, frustrating and unprofitable. So thank you. Thank you for paying your bills on time. Thank you for getting us the materials that we request so we can do our jobs. Thank you for being there when you say you’ll be there. Thank you for not keeping us waiting, changing the dates of our visits again and again and letting us know in advance if there are any plans in your company that will affect the services that we’re performing. You want to learn, not attack. We provide technology services. That’s our expertise. It’s not your expertise. Thank you for recognizing that. We appreciate that when you don’t understand something you don’t attack us. You don’t become defensive. You don’t unfairly accuse us of taking advantage. You respect our role and our expertise. You don’t hide your insecurities or lack of confidence behind an angry tirade to make yourself look better in front of your employees. You are not afraid to admit that you’re ignorant about certain things. We all are. You ask us to explain these things, to educate you, to help you learn how you can be better. We appreciate this. We hate feeling like we’re the bad guy or that we’re doing something underhanded or taking advantage of your ignorance when it’s really you that doesn’t understand. Thanks for admitting this and being a good partner. You are the best kind of client Andrew. You know what you know. And you know what you don’t know. You hire us, and other outside service providers, for our expertise. You don’t nickel and dime. You’re not confrontational. You recognize, correctly, that we are in this to help you succeed. Because when you succeed we succeed. Good service providers know this. And so do their customers. Yes Andrew, I love you. But no, not in that way (not that there’s anything wrong with that). I love you because you’re the best kind of customer there is. Introducing…our new series: On Track With Jack. Each week, look for our new emails and blog posts from our mascot, Jack the Jangolope, on marketing advice, trends, and quick tips. Jack will offer insight on how to improve your email marketing so you can use your JangoMail account to the fullest. He will cover common support issues we receive from our call center, and the latest news in email marketing, to keep you on track. What is a jangolope and why does one named Jack have tips for me? To start, a jackalope is a mythical creature known as a jackrabbit with antelope horns. Over time the jackalope continued to change into what we, at JangoMail, call the jangolope. Long, long, long ago a curious jackrabbit stumbled upon an old computer. He grew tired of receiving and sending plain, ineffective emails. He knew there had to be an easier way. The jackrabbit thought long and hard. Finally, he had an idea to evolve email marketing above all the rest. As his idea grew, so did his antlers. Through the wild countryside of North America, the jackalope soon became known as the jangolope because of his savvy computer skills. Jack is a direct descendant of the original jangolope. Half jackrabbit, half antelope, 100% email marketing professional. Hop into our blog each week with Jack's helpful tips! Remember, at JangoMail it's your email, your way. Have a topic you would like Jack to cover? Email us at marketing@us.jangomail.com with the subject line: On Track With Jack. Jack also has his very own Facebook page. Follow Jack on Facebook. JangoMail has for a long while offered a private label solution, such that you can fully brand the JangoMail solution around your own name and domain. For more information, click here. Given the launch of JangoMail's new interface a couple weeks ago, private label solutions can now be upgraded to use the new interface. The one key difference in personalizing the private label application now versus in the old interface, is now you can upload a custom stylesheet (CSS file) which will override the JangoMail default styles. Previously, you had to delinate ahead of time logo choices and color choices for certain areas of the application. Now you have the ability to override any style by uploading your own CSS file to ftp://yourprivatelabeldomain.com. 1. Contact Support and ask them to convert your master account to the new UI. 2. After the appropriate response, login to your master account from www.yourprivatelabel.com website. 3. You can customize all styles within the interface by overriding the default JangoMail styles. Upload your CSS file to ftp://yourprivatelabeldomain.com. The easiest way to determine what styles to define is to use the Google Chrome browser while logged into the private label, and hover an area you'd like to change, and hit CTRL+SHIFT+C to reveal the style tag associated with that element. In this example, the style div#wrapperNav is revealed, and can be overridden. Create a file called CustomStyles.css and FTP it to the root of ftp://yourprivatelabeldomain.com. 4. You can experiment with your CustomStyles.css file on your master account until the desired look and feel is achieved. After you are done designing, contact Support again to upgrade your sub-accounts to the new interface. It all starts with the email subject line; the first thing people see when they receive an email. The goal of any effective email relationship is to hook the attention of your audience right from the start, delivering your message in full to retain high open rates. So, how do you get the click? Follow these five simple, yet effective subject line strategies to keep them coming back for more! 1. Be Direct And To The Point: At glance, your subject identifies the content of the email. Whether you are announcing a special offer, event, or news update, be clear about the campaign. Don’t send mixed signals. We recommend approximately 50 characters or less, with the exception of highly targeted emails. 2. Keep The Mystery Alive: Don’t lay it all out on the line. We want to intrigue our readers to read on, inviting them to open the email and read our message in full. Use catchy words to trigger interest, while capturing the purpose of the email. 3. Stay Fresh: Repetition will lower open rates. While it's important to establish a brand, each subject line should highlight new content. If you have a long-term message, work on building your brand to compliment your new material. 4. Say ‘No’ To Spammy Words: Remember to always put yourself in the shoes of the recipient. What emails attract you? Which ones do you delete right out of the gate? Avoid excessive use of words like free, help, percent off, and reminder. Multiple exclamation points, dollar signs, words in all CAPS, and these keywords and phrases will trigger spam filters. 5. Testing 1, 2, 3: When in doubt, test! Worried about a long-term message? Test and see what works best for your audience. If you have any questions, please contact us for help! I’m still (relatively) young, so I don’t want to sell my business. Also, I have optimistic hopes for the economy over the next few years and this may be a good period for me to earn a few bucks, particularly after all the past slow years. Yeah, I’m definitely not going to cash out. But these are not the real reasons why I’m not ready to sell my business. The real reason is this: my business isn’t worth very much. Sure, I’ve got plenty of customers. But none of them are under a long term contract so there’s no guaranteed revenue stream. And, being a service business, I don’t have many assets. I’ve got cash and accounts receivable and that’s worth something to a potential buyer. I have no debts and my payables are low, so that’s also a good thing. But I don’t have any real property or equipment, except for a few computers and some office furniture. Maybe your business has a better balance sheet than mine. Maybe you’ve got a lot of equipment that has a good resale value. Or a warehouse full of inventory. Or long term contracts, or a big building with a low mortgage. If you do then good for you. Those are all hard assets and they all have value. So you’ll definitely get a price for those. But that’s not a business. Those are just assets. Each one of them has a market value. They can be sold off as a group or individually. You’ll hopefully get more than what you paid too. But you’re not going to get what your business is really worth unless you build up a business that’s really worth something. One that can stand on its own. That’s the mark of a truly valuable business. Take a McDonalds franchise, for example. Now that’s a valuable business. Sure, there’s equipment and property and hard assets. But there is also something else: a process. If you own a McDonald’s franchise your employees know the process. Everyone knows their job, from the manager down to the fry cook. There are procedures to follow. There are written manuals. And rules. If the fry cook leaves then you replace him with another fry cook who gets trained accordingly to those same procedures. You buy from the same suppliers under established, long term contracts. You have the same procedure for selling products to your customers, one that minimizes time and maximizes output. Heck, even if your manager ups and leaves you can find and teach another manager. You’re just inserting that person into the system. It’s like a machine with replaceable parts. Is your business like that? Can you disappear for a week, two weeks, three weeks and it just keeps running? Do you have a system in place? I don’t. If I were to get hit by a bus tomorrow my business would fold up within weeks. I have no procedures or policies. I’m a micromanager. Everything needs to pass through my hands. Every job is different, every project unique. If someone were to buy my business they would need to also hire me along with it. Who else would keep things running until the new owners could establish their own mark? This is not value. This is just another excuse for employment. I’m not complaining, mind you. My business is doing well. And it’s been growing. For the past twenty years my company has provided a livelihood for me and my family. It has been a source of income and support for my employees and contractors. But besides its cash and receivables it’s really not of any value to anyone. Is yours? Gene Marks writes daily for The New York Times and weekly for Forbes, Inc. Magazine, Huffington Post and Fox Business. He runs a 10 person consulting firm outside of Philadelphia. Some of you may have noticed that over the weekend we launched two new buttons on our interface. The old Save/Send A Test button has been replaced with two new buttons, so you can save without having to send a test email. The Save button saves the email campaign you are working on and the Send A Test generates a separate preview, but does not automatically save. It creates a new version in preview form. Please remember to save often! When you are ready to send your email, you need to make a copy of the email, and then you can send. If you have any questions regarding the change contact us at: 1-855-709-4099, or submit a ticket at jangomail.com/support. The wait is over! 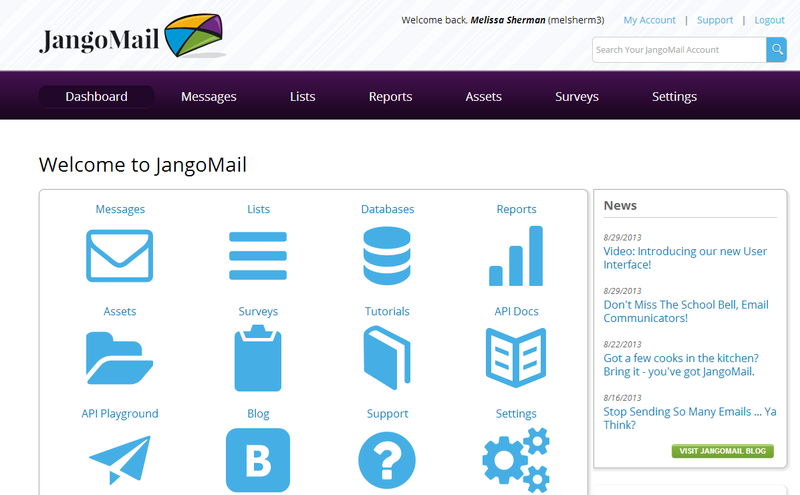 We are pleased to announce our new user interface here at JangoMail. The new design combines the old with the new. We’ve taken suggestions directly from you, our valued clients. Enjoy our fresh new look that is easy to use and navigate, delivering the latest to you in email technology. New Look: You’ll notice new matching colors to the site along with a well organized, easy to use dashboard that houses popular links. These shortcuts are not only visually appealing, but convenient for easy access. Walkthrough Guides: Each user will appreciate the walkthrough guides which give an interactive tour of the entire system. You will initially be prompted to take the tour, but can recall or hide the guides at anytime. Navigation: The most important change has been made to our navigation. 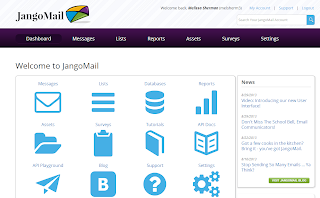 JangoMail now has submenus which allow users to access features within the Reports, Messages, and List sections without interrupting any work. Help Section: Whether you need a quick reference point or have an in-depth question, our help sections are everywhere. Access explanations, useful links, tutorials and tips on each page to the right. Countdown: At the very top of the page, you’ll notice our new countdown feature which tracks the number of days left in your usage period, your next usage period, data used, and number of sent messages. Note the Upgrade Account button next to the countdown for an easy upgrade. The goal of our new interface was to improve our overall look and usability. We hope you enjoy our new features and look forward to answering any questions you may have. Please don't hesitate to call us at 855-709-4099, or submit a ticket at jangomail.com/support.